Anybody who keeps up with these blogs will know that I’m not exactly one for Netflix binge-watching. Certainly not when it comes to television shows, as a rule I tend to stick to movies. I can handle a couple of hours, but when I’m forced to sit through an entire series of near-feature length television episodes my mind takes a bolt for the door. Maybe I have a poor attention span, or maybe I just can’t be arsed. I haven’t worked that one out yet. Every now and then, though, something will catch my eye. If you’re a fan of space-opera, you’ll know that its a somewhat underrepresented genre. Only with the success of Guardians Of The Galaxy (2014) have we seen some renewed interest in mainstream media. This might be a complete coincidence, but it seems fair when you consider two SyFy series that began in 2015, which just so happen to now be available on Netflix UK. 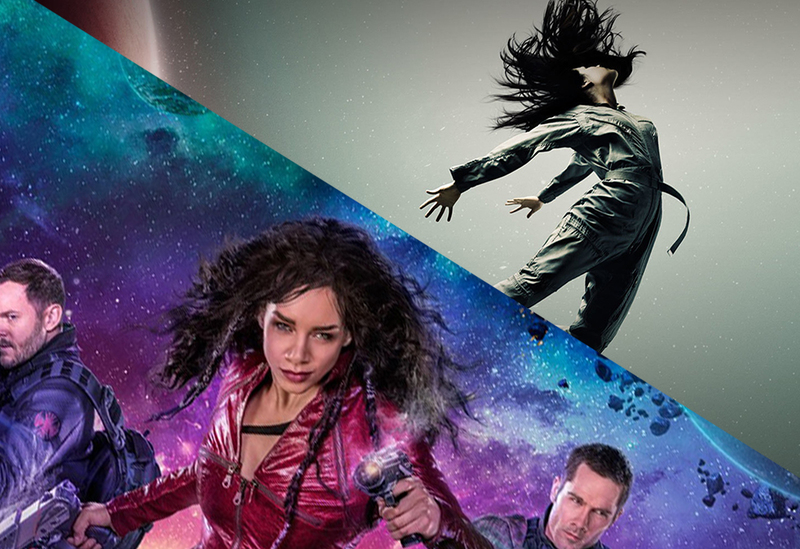 The two series in question are The Expanse (a 2015 adaptation of a series of novels by Daniel Abraham and Ty Franck) and Killjoys (an original created by Michelle Lovretta and co-produced by Canada’s Space channel and SyFy). For those who haven’t seen either of these, don’t worry. I won’t be going into spoilers here, but I am fascinated by how two relatively similar settings can create a very different tone and atmosphere. I should also say that I loved both series – but for very different reasons. To summarise, The Expanse is a tale told from many different perspectives. Humanity has divided itself into three major factions – the wealthy United Nations of Earth, the militaristic Martian Republic and the proud – but impoverished – people who exist on the asteroid belt – known as ‘Belters’. Between these factions, an uneasy truce binds them together in peace, but tensions are raised after a mysterious attack on a mining ship on the fringe of known space causes each faction to start pointing fingers – often with bloody results. 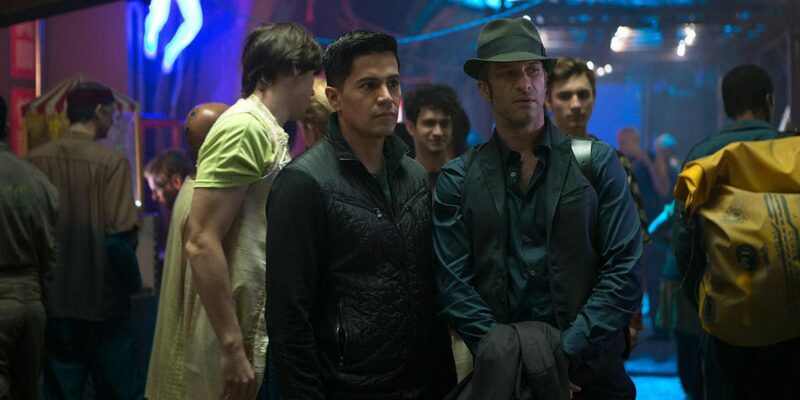 We are quickly introduced to the principal cast, including Belter police detective Josephus Miller (Thomas Jane), United Nations executive Chrisjen Avasarala (Shogreh Aghdashloo) and ship’s officer of the aforementioned mining ship, Jim Holder (Steven Strait). Having survived the initial destruction of the Canterbury, Jim and several surviving members of his crew escape into the void, where they are given the opportunity to investigate the cause of their ill fortune – and begin to uncover a sprawling conspiracy that threatens every faction. Meanwhile, detective Miller is sent to investigate the disappearance of a wealthy tycoon’s daughter, while UN Executive Avasarala is sent to ease the growing tension between Mars and Earth. It doesn’t take long before these characters’ stories begin to weave around one another – and by the finale of the first season, well, things start to get serious. 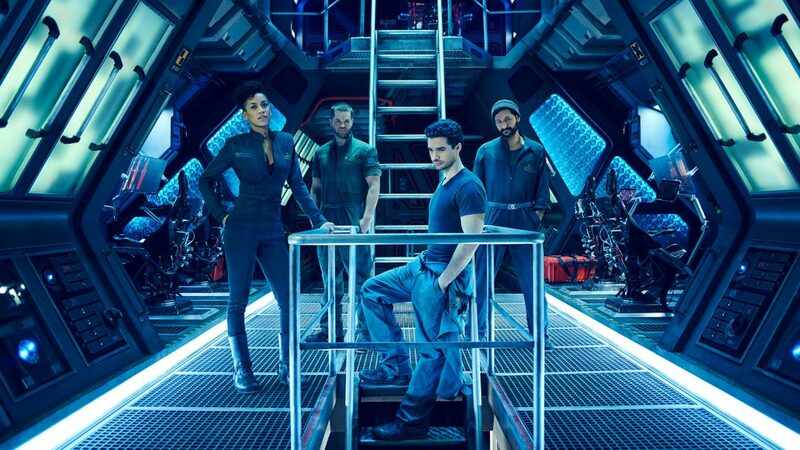 The production on The Expanse is without fault. While it has a slightly cheap feel about it, the set, sound and costume design has a very organic (if only slightly cheap) feel to it. In many ways, the tone and style can be compared quite favourably to 2005’s Battlestar Galactica – eagle-eared viewers might even recognise some of the sound design – I know I certainly did! 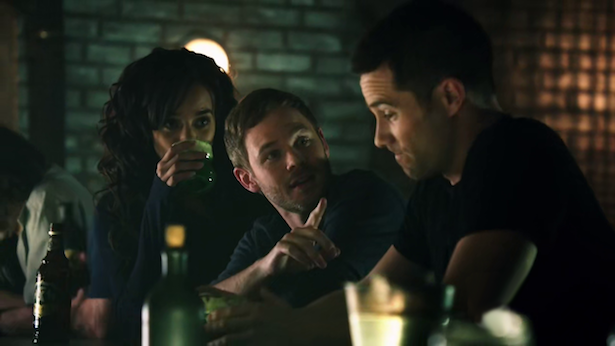 On the other hand, Killjoys follows a far more light-hearted model of storytelling. In a part of the galaxy ruled by the morally ambiguous Company, Killjoys follows a trio of bounty hunters working on behalf of the loosely organised Reclamation Apprehension Coalition (or RAC). Given warrants of varying risk and reward, the duty of a Killjoy is to complete the objective at hand without regard to themselves and without allegiance to any government or individual beside the RAC. 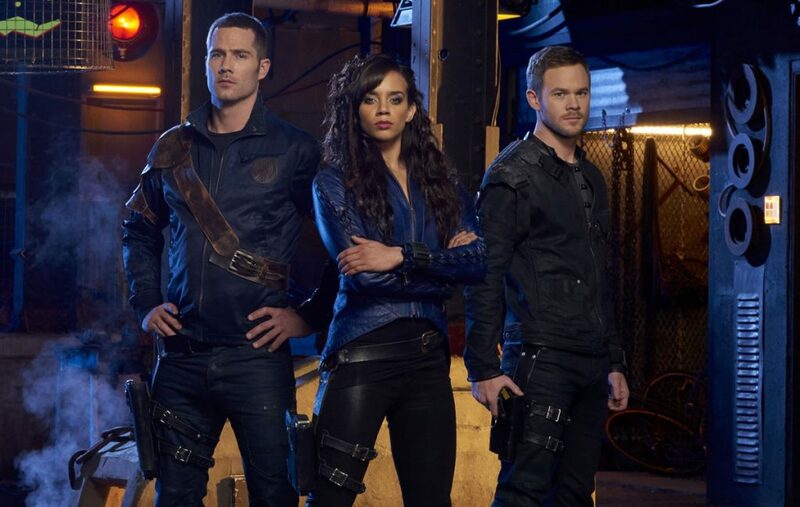 Making up the crew of the titular Killjoys are Dutch (Hannah John-Kamen), an experienced agent with a mysterious past; John (Aaron Ashmore), the crew’s ‘nice-guy’ and technical expert; and D’Avin (Luke MacFarlane), John’s brother and former soldier with a mysterious past. So far, so Joss Whedon, but these characters fall between the standard tropes of the genre – mostly because they are willing to actually have fun, despite their troubles. In comparison with The Expanse, Killjoys has a far cheaper feel to its production design. Not that the costumes or props look terrible, far from it – but it does suffer a little from the traditional Stone Quarry/Alien Planet problem of older space operas. The show itself looks great, even spaceships look great, but their job is to ferry its characters from county house to industrial estate, which works in context but, I think, suffers for its lack of cohesive setting. Killjoys, however, eschews the typical spacey soundtrack and aims for a far more contemporary indie soundtrack, which ladles on character like an overzealous soup chef. Arguably, this can be quite cheesy – particular in combination with the omnipresent slow-motion action shots – but, hell, we all like a bit of cheese every now and again, don’t we? For all their differences, however, The Expanse and Killjoys both centre around humanity spread out across the stars, their technology old and tired. Both are firmly set on the cynical end of the spectrum, and both are controlled by ruling parties with more shades of grey than a horny housewife’s Kindle library. They also both involve wider conspiracies – but I won’t dwell on that for fear of spoilers (not that this isn’t immediately obvious). What really sets these series apart is method of storytelling. Virtually all works of fiction find themselves somewhere on the spectrum of character vs plot. You’ll find this discussed mostly in terms of writing, although direction also has a huge part to play in determining this in a film or television format. I won’t go into detail on this (but definitely check out https://www.writersstore.com/character-driven-or-action-driven/ for a far greater insight, but the idea is that on one side of the spectrum, characters are relatively meaningless. The grander story is what drives the plot forward and creates the conflict in the narrative, with little time devoted to character development and individual arcs. A relevant example of this would be Alien (1979), where the story is about running away from a big slathering creature, not so much about Lambert’s desire to overcome her ordinarily calm demeanour. In contrast, a character driven story is one that follows individual characters as they confront their own inner demons and develop as people as the story continues, at the cost of allowing the audience to indulge in the greater plot. Another relevant example would be that of Star Trek: The Original Series. The weekly villain isn’t as important as the relationship between Kirk, Spock and McCoy and their individual viewpoint on how the solve the problem. Lost is another great example. The Expanse is far more plot-driven. While it is not a textbook example, as its characters are vital to telling the story, they mostly feel quite insignificant when compared to the wider story. As the mystery is revealed, the audience is made to comprehend and understand the conspiracy they are being confronted with. The growing intrigue builds with each episode, and will likely last for many seasons to come. Killjoys, on the other hand, couldn’t give much of a toss about the wider context of the story. It establishes a setting and lets its characters run wild. As time goes on, we discover more about each of our favourite bounty hunters, and their inter-personal relationships drive conflict and create the stories we see, with the wider story developing around their situation. On the whole, I have to say I prefer Killjoys. It isn’t often that I find myself invested in a cheesy, campy space opera – and I’m loving every minute of it. As a fan of sci-fi, the harder the better, I feel like I’m betraying my opinion there – but hear me out. I admit that the character arcs are a little predictable, and yes, everyone is a couple of degrees hotter than the sun, the pace and tone is forgivable enough to let the audience take in what they’re watching and enjoy themselves. There is some great sci-fi here, and there simply isn’t enough of that to go round these days. Especially not sci-fi that also has so much fun. What’s more, this might well be one of those shows that you can actively encourage people to watch before you get them to indulge the really heavy science fiction you. A Gateway Show, if you will. A Gateway Show that I might just go and watch right now.